An enchanting 1860’s taupe and royal blue silk spoon bonnet. The ruched taupe fabric is laid over a wire base. 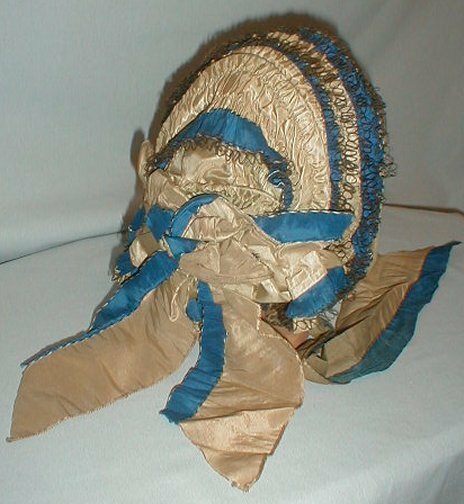 The bonnet is lavishly pleated royal blue silk. The bonnet is also trimmed with thin bands of black lace. The back is decorated with a large taupe and royal blue silk bow and streamers. The bonnet has a 4 ½ inch back curtain. The inside brim is lined with black net lace and the crown area is lined with buckram. The bonnet is in very good condition. As can be seen in the photos there is one missing chin tie. There are a couple of small pea size spots and light soiling on the remaining chin tie. There is a small section of missing lace on the front brim. A wonderful bonnet to add to any collection.